The titles are self-explanatory for the most part. "Start Minimized" means that the RoboDJ window will not be visible at startup. Show This Tab on Startup sets the default tab that will be visible when starting RoboDJ, such as the Graph tab or the Manual Play tab. This sets the time increments shown on the grid on the Schedule tab and the Start Time increments available on both the Timed Play and Schedule windows. Note that RoboDJ will override the Play Rotation if a particular type of song is exhausted and resets. Note also that RoboDJ uses fuzzy matching to build its song library. This means that different takes of the same song will only play once. Simon & Garfunkel's "Bridge Over Troubled Waters" and "Bridge Over Troubled Waters (Live)" are considered the same song and will only play once within the Play Rotation time. Remakes and re-sings by the same artist in different decades are also considered to be the same song and will also not repeat in the Play Rotation period. The Sound Recording Performance Complement is is a special law restricting the playing of songs by the same artist within a 3-hour period. 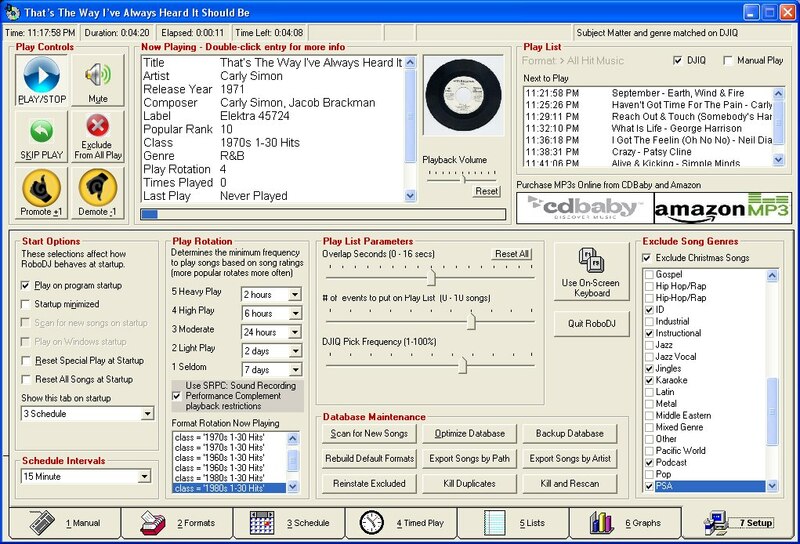 RoboDJ attempts to restrict more than 3 plays by the same artist within any 3-hour period. This will be violated if you do not have enough songs in a particular style, such as the Cajun/Zydeco genre mentioned earlier, and RoboDJ is forced to reset. Also, note that performers within a band are not equivalent to the performers solo. For instance, Paul McCartney and the Beatles are not considered the same performer. When the Use SRPC flag is not checked, RoboDJ will use the Play Rotation to determine replay parameters. This shows the song style rotation of the current format. It indicates the next style of song to be added to the end of the Play List. RoboDJ uses four audio players so that songs can eclipse each other or overlap. RoboDJ can play audio clips as short as 2 seconds, so that sound effects, applause, or other wild tracks can be included within a format. The default setting is 8 seconds, which is good for most pop and rock songs. If too many songs start too soon, reduce the amount of overlap to 5 or 6 seconds. This sets how far into the future RoboDJ will select the upcoming songs that appear in the Next to Play window. Another song from the Beatles' "Second Album"
The DJIQ Pick Frequency setting determines how often DJIQ will make a selection for you. Default is 66%. Setting the frequency too high will result in RoboDJ running out of usable songs and resetting too early. Note that the DJIQ Pick Frequency is used only when DJIQ is turned on in the Play List section of RoboDJ. The default is DJIQ turned off. Use these buttons carefully! They affect many things critical to the functioning of RoboDJ. This can be used while RoboDJ is playing. Clicking this button will cause RoboDJ to check all folders on all hard drives, network drives, and USB memory sticks available to it. RoboDJ will add new songs and other MP3, AAC/M4A, and WMA audio files it finds. No existing database entries will be changed. The RoboDJ database can become sluggish after a few months of use. This function re-indexes the database and removes extraneous data, reducing the size and speeding up access to the data it contains. Use it if you feel RoboDJ is becoming a bit sluggish, or at least once every 6 months. RoboDJ will create a compacted backup of the database. RoboDJ comes initially with a set of default formats so that the user can set it up easily. This function rebuilds the default formats using the parameters originally used. If you deleted default formats, RoboDJ will re-create them. This is a comprehensive listing of every song and other audio file in the RoboDJ database, arranged by order of file path (or folder). This is a comprehensive listing of every song and other audio file in the RoboDJ database, arranged by order of artist. This is good for seeing in black and white what songs you have. The RoboDJ Exclude from All Play button excludes songs from ever playing again. The Reinstate Excluded button removes the exclusion from all songs marked for exclusion. This button erases duplicate songs from your hard drive, network drive, and/or USB memory sticks, mainly to save space. This is recommended only if you have already backed up your music elsewhere. Having identical songs, even exact duplicates, will not cause any problem to RoboDJ because it always treats duplicate copies as one song. This is the heavy hitter of RoboDJ. Don't use it unless you want to totally start over! Kill and Rescan totally erases the RoboDJ database and rebuilds it from scratch. The only data that remains after Kill and Rescan are the default formats, the Play Rotation and other settings. If you had changed items on individual song or audio files, this data will be lost. Holiday songs are not in a Genre because they can be rock, country, singer/songwriter, blues, etc. Holiday songs are in a Class. RoboDJ flags holiday songs by title, album title, and any other information it finds and automatically excludes them by default. By un-checking the box you can have these songs play during the holiday season. The list box shows every genre discovered by RoboDJ and allows you to exclude the ones you don't want. Podcasts and any songs longer than 15 minutes are excluded by default. You may select and de-select any genres you wish; they will be included or excluded immediately. The built-in Windows floating keyboard window appears. This is handy if you do not have a keyboard connected to the computer, it is inaccessible, or you have a touch-screen. This button stops RoboDJ immediately. If RoboDJ was set to automatically backup its database, the backup will be done at this time.